Availability: Second hand. Maybe the PSN store one day? Along with Warhawk, Twisted Metal served as my introduction to what the PlayStation had to offer. Released just two months after the ‘Station’s debut in the states, it was close enough to be considered a launch title and still a fresh idea. 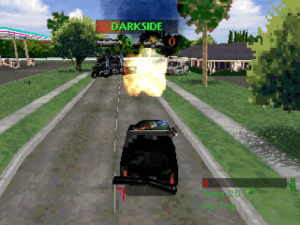 On top of which, textured polygon engines were still fairly rare in ’95 – even on the PC – so Twisted Metal demonstrated something astonishingly new over the PSX’s 16-bit cousins. It helped that it was also a great deal of fun. So with its 2012 reboot hitting stores, let’s take a peek back at everyone’s favorite car combat game with a demented clown mascot. The first level is an enclosed arena against a single opponent. It only gets bigger and tougher from here. Twisted Metal’s premise is as simple as any of the classic arcade tournament games: the enigmatic Calypso has invited 12 of the world’s best drivers to participate in his underground tournament. The streets of Los Angeles are the arenas, the rules are non-existent, and the winner gets a single wish granted with no restrictions (except that, like the “Monkey Paw” story, the wish usually gets turned around on the wisher). Players face off against a randomized group of AI opponents (pulled from the roster of unpicked playable characters) in enclosed sections of town. Using weapons mounted on the car, you’re out to cause as much damage to the other drivers as possible without taking too much yourself. If you’re the last car standing, you proceed to the next arena. In terms of design, it’s identical to Deathmatch multiplayer coming out of the PC’s FPS classics. Everyone fights for themselves and builds up their arsenal using pickups found around the arena. Pickups respawn over time, so you’re going for an optimal path through the arena to hit the next pickup as it appears. Similarly, you use the levels to segregate enemies – hopefully preventing them from ganging up on you – and try to swoop in on weakened, vulnerable foes when the opportunity presents itself. Truly, the only difference here is that you’re controlling cars – and their loose, arcade handling makes it even less unfamiliar. There’s obvious bias toward accelerating forward, but it’s easy enough to swiftly drop into reverse, hold down the handbrake to flip around, or turbo sprint out of the way. This accessibility is part of what makes the game fun. There’s no need to worry about shifting gears or damaging tires, and even brutal crashes simply knock the car around a bit before resuming with no degraded performance. You jump right into the arena and pound your opponents into scrap. 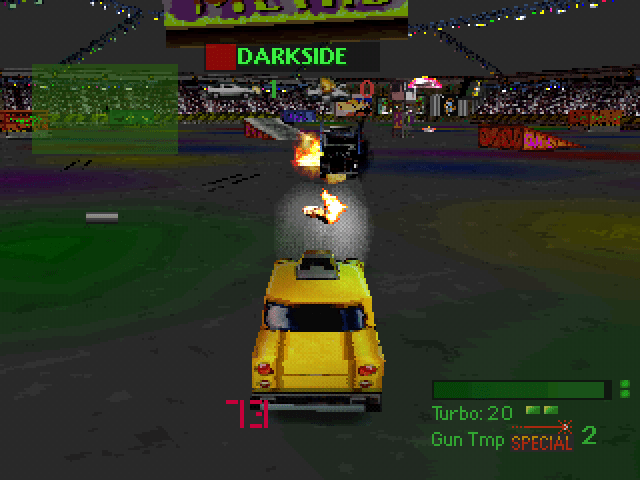 It’s an exciting, – erm… “High Octane” – version of the demolition derby with guns. Weapons are balanced well, if a little weak. Machine guns have infinite ammo but can overheat, and are only useful to chip off a nearly-defeated enemy’s final slivers of health. Collectable rockets come in many flavors, from the standard “fire,” the weak-but-nimble “homing,” and the rare “power” missile. The strongest attack will usually come from each car’s unique, recharging special ability. These range from thrown explosives, laser beams, evil spirits, or simply crushing opponents under monster truck tires. All of these weapons work best when chasing down a car ahead of you, while a series of droppable traps (mines, oil slicks, spikes, catapults) help throw off any pursuers. Fighting two enemies at once? Just means there’s fewer to chase down later. There are only six levels, but each location is a blast. The tournament scales well; starting with a simple one-on-one match in a small stadium, then expanding the number of drivers across warehouse district, freeway, and rooftop levels. “River Park Rumble” takes place in a shopping district decked out for Christmas, complete with ice rink and helpless skaters. “Cyburbia” is the largest level, with a high school, convenience store, aqueduct, and rows upon rows of suburban houses. Environments are mostly static, but there are a few crates and similar items that can be destroyed (such as a large glass skylight on the rooftop level, opening access to a hotel interior). Aside from the visual appeal, these areas are also smartly designed. They loop well, and keep the gameplay moving. 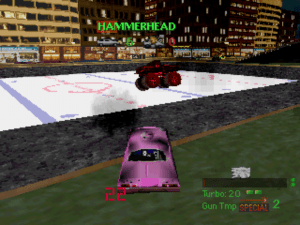 The first Twisted Metal includes basic split-screen multiplayer for only two players – 4 player multiplayer wouldn’t happen until Twisted Metal 3 (or the PC port of TM2). This means it’s much more a single-player experience than later entries in the series. Luckily, the strength of the characters makes up for this. Each is balanced, and features varied stats that affect how they play; Mr. Grimm is a weak motorcycle with a killer special, Darkside is a heavily-armored truck with noticeably reduced maneuverability, etc. They’re unique enough to force you to tweak your tactics, which obviously helps the replay value. Each character also has a story. These are straightforward reasons for joining the competition, with a final ending screen where their wish is granted. It’s a basic concept pulled from Mortal Kombat or Tekken, but it does offer a reward for beating the game, as well as additional encouragement to do it again with all the characters. My only disappointment here is that they’re simple scrolling text screens, and I wish they’d kept the cheeseball original FMV endings. Hear that, Calypso? The game’s pretty tough at Normal and higher difficulty. Part of the reason is that your options to avoid damage are limited (drive behind a building before the missile hits). There are no countermeasures to deploy or shields to collect. Your chances to repair are scant as well. Each level has electrified ramps that will repair your vehicle a bit, which then shut down to recharge. You have to balance your use of these smartly, or simply drive around for minutes waiting for one to activate again. If you lose all your health, you lose a life. Lose three lives (with no way to gain more), and the game is over. Downtown L.A has a great variety of unique sights and ramps. It’s also tough because you’ll have to destroy every car yourself. The AI puts on a convincing show, but if you really look, you’ll see that none of your opponents are actually taking extra damage over the course of the match. One opponent got away from me with only a scrap of health – when I found him again, minutes later and after beating three other cars, he was still trucking along by that same thread. I suppose the idea is to keep you from hanging back and letting the AI do all the work, but it does eat into the whole “car combat melee” feel. This first entry also has soldiers with rocket launchers dotted around the streets. You can drive over them, of course, but often not before taking additional damage from their attacks. The odds are fairly stacked against you. Marketing materials make the game look like something a Juggalo would produce, but the actual graphics are grounded in a grimy reality. I like the dull, urban look more than Twisted Metal 2’s bright, worldly palettes – but this, of course, is subjective. Building textures warp quite a bit on corners, but are generally detailed. Car models look great, and though they don’t reconfigure as they do in later games, they do show three levels of progressive damage. The soundtrack is some generic metal, but it certainly fits. About the only complaint is that all weapon pickups are generic pink bubbles that you can’t tell apart from a distance. This gets fixed as early as TM2. 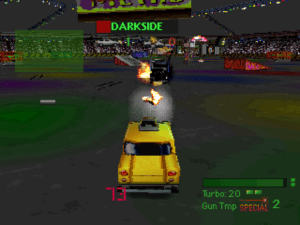 The only thing the first Twisted Metal really lacked was expanded multiplayer. While only six levels does make the single player campaign short, the challenge at higher difficulties along with the diverse characters definitely make it worth playing much more than once. Overall, a pretty awesome freshman effort. Later entries in the series would start to stray from the path more than iterating on this one, but the first game is definitely one of my favorite PS1 titles. Responsive arcade handling. Strong graphics for ’95. Interesting characters with worthwhile gameplay differences and story endings. Enemy AI cars won’t kill each other, so all the heavy lifting falls on you. Multiplayer is limited to abbreviated arenas and two player split screen.